Located in Lansdale, Pennsylvania, in a suburb of Philadelphia, USA, Clemens Uniform is a family owned laundry that has grown from the coin operated laundry started by Paul and Kathryn Clemens in 1963. Eventually, the Clemens family expanded the business into full service dry cleaning, and after operating several dry cleaning stores, they decided to diversify into uniform rental. In 1986, Clemens Uniform was started in the back of Clemens Cleaners on Main Street in Lansdale, PA. In 1988, Clemens Uniform relocated to the current location on West Fifth Street in Lansdale. The business has successfully grown by providing customer focused mixed industrial laundry services including uniforms, mats, linen rental, mops, towels, and first aid supplies. The second generation is now managing the family business, as Paul and Kathryn's daughter, Janet, oversees the business finances, and their son, Randy, is the general manager of the uniform and linen rental businesses. Randy's wife, Rose, oversees first aid and promotional aspects. In June 2016, tragedy struck as the Clemens Uniform facility was damaged by a fire. The family was faced with rebuilding their laundry in the same location, while at the same time maintaining their business operations. 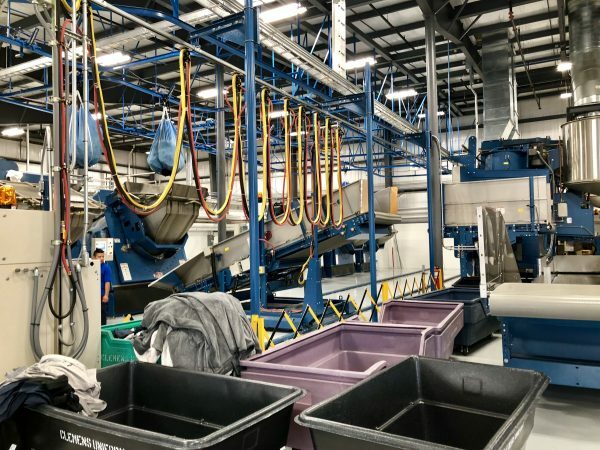 After 30 years in the laundry industry, Clemens Uniform had a loyal base of customers and Randy was able to outsource their laundry operation to other local laundries. This allowed the business to sustain operations and during the period of time the laundry was outsourced, the revenues increased. 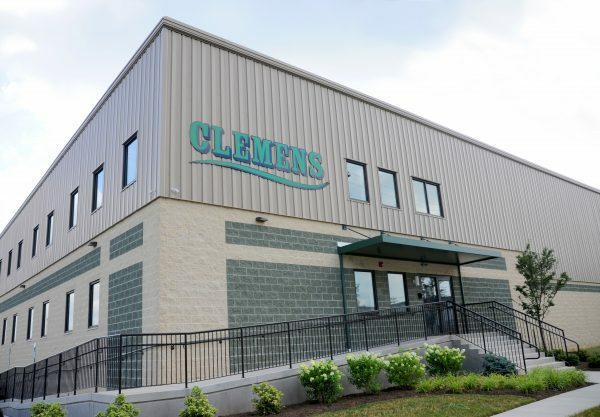 Randy was committed to rebuilding the laundry with 'state-of-the-art' technology that would allow Clemens Uniform to remain competitive in the market place, increase employee productivity, and control cost associated with the laundry operations. The current laundry task was 140,000 lb (63,503 kg) per week, operating the laundry 48 hours per week with a total of 55 full time employees. 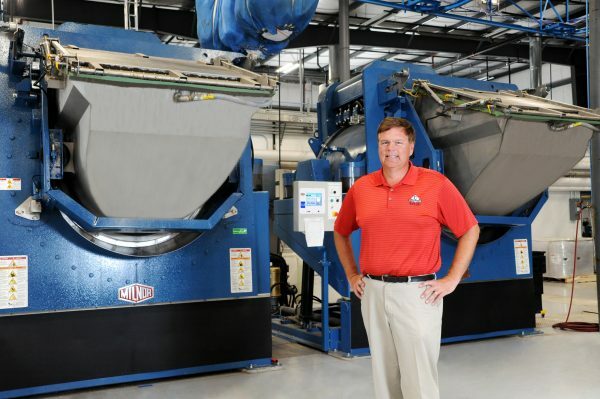 When evaluating the required wash aisle and dryer equipment, Randy researched the options from several washer-extractor and dryer manufacturers. 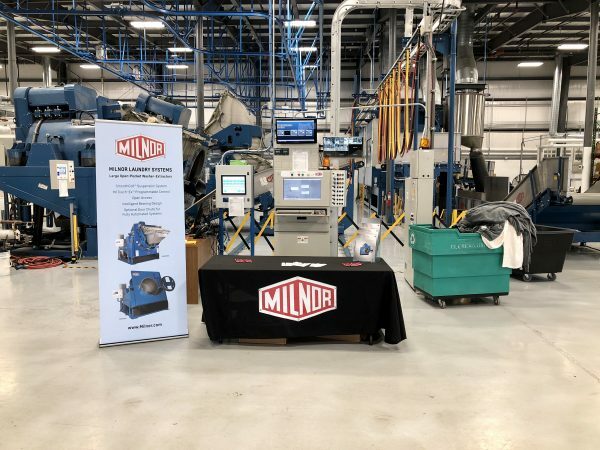 David Carter, Vice President of North America Sales with Pellerin Milnor Corporation, had requested that Randy make one last trip to see the Milnor large open-pocket washer-extractor and dryer technology that Pellerin Milnor offered. Along with Milnor's local dealer representative, Mike Kost of PAC Industries, Randy visited the Milnor factory and several regional laundries in Louisiana. 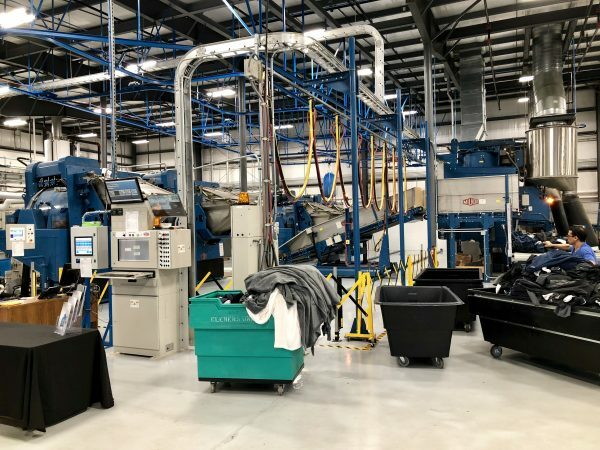 "When I walked in the A-1 Service Laundry in Baton Rouge, Louisiana, and saw an overhead sling automatically loading walk-off mats directly into a Milnor 450 lb open-pocket washer extractor, I was sold!" Clemens stated. He also commented that "No other manufacturer was able to demonstrate this feature that included the integrated automatic overhead chute loading door." The new Milnor laundry equipment included two (2) each Milnor model 72046M5K, 272 kg to 318 kg (600 lb to 700 lb) capacity open-pocket washer-extractors; two (2) each Milnor model 68036M5K, 182 kg to 227 kg (400 lb to 500 lb) capacity open-pocket washer-extractors, and one (1) Milnor model 48040M7K, 125 kg (275 lb) capacity open-pocket washer-extractor. 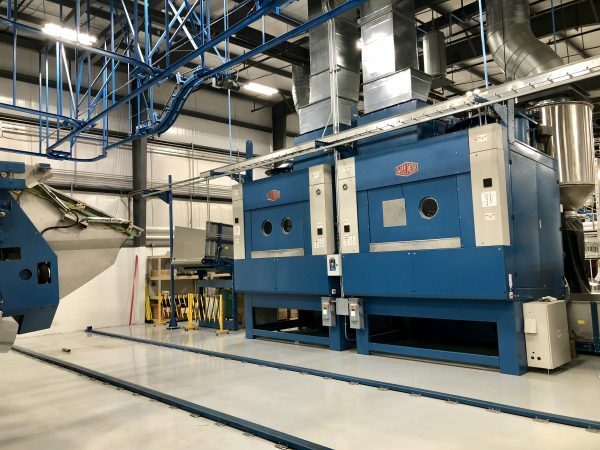 While the washers can be manufactured as manually loaded machines, all of the washer-extractors at Clemens Uniform were configured with the integrated automatic overhead chute-loading door. The chute-loading door, combined with the MilTouch-EX™ control unit with WTB+ interface, streamlines the entire wash cycle into a fully-automated process. The MilTouch-EX control unit uses resistive touch screen technology and full VGA resolution to show current machine status info, including total time, formula time, and time elapsed. The control unit allows for complete programming flexibility and access to the machine's function at every level and wash/rinse step within safety limits. 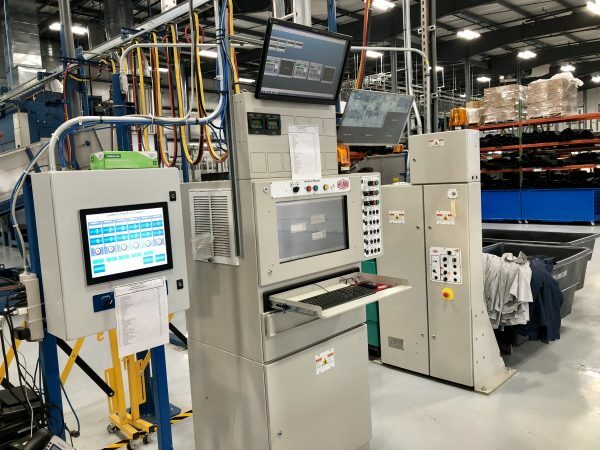 The automated washer-extractors wash process begins with a 21-degree backward tilting function that provides safe, fast, and efficient loading of the goods. Once the overhead slights have loaded the machines, the integrated door chute closes. 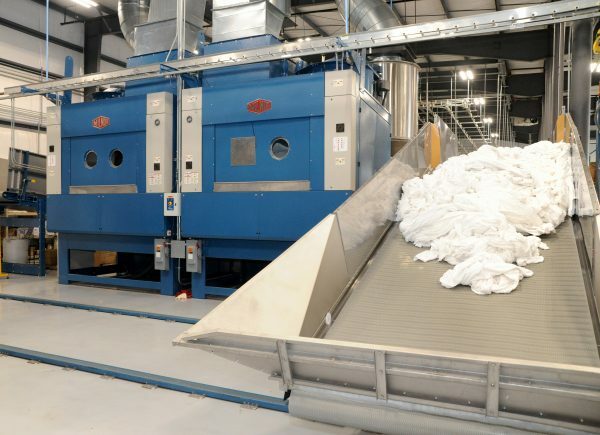 The washers return to the upright position for washing and since the automated chute is also the door, time is saved during the loading process. Other systems have separate doors and chutes. With those systems, the chute needs to be lowered and raised in addition to opening and closing a separate door. The Milnor integrated door chute eliminates the separate door. After the wash process, each washer is capable of achieving up to 300G high extraction. 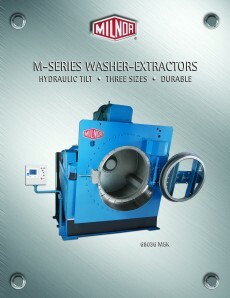 The M-Series washer-extractor suspension system incorporates an arrangement of shock absorbers to manage side-to-side motion and Milnor's unique SmoothCoil™ springs system. The dynamically tuned suspension system is arranged so that the center of mass is where an imbalance would occur. This allows for superior vibration dampening, less wear and tear, constant vibration isolation, corrosion resistance and effective noise reduction. The washer-extractors also include a unique bearing design that provides quadruple protection of the crucial bearings with three water seals and one excluder ring. The 68036M5K and 72046M5K models also incorporate channels that allow wash liquor or rinse water to bypass worn seals so that it does not come in contact with bearings. This minimizes chemical and sediment effects on the bearing. Once the wash process is complete, the chute lifts up and the washer-extractors tilt 21-degrees forward to discharge the goods. At Clemens Uniform, the goods are discharged onto an automated Milnor loose goods shuttle. 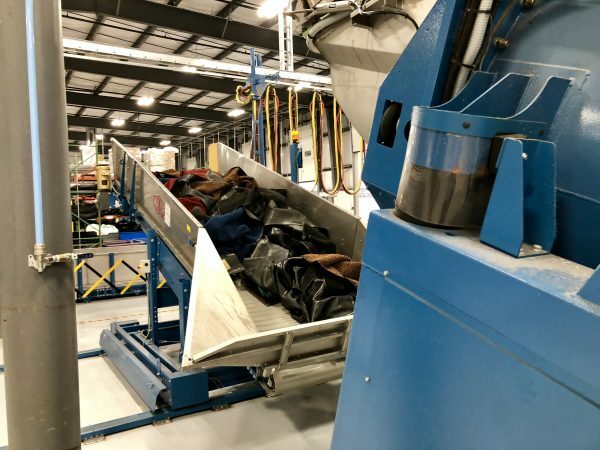 The shuttle belt traverses via rail and automatically loads either of the two Milnor model 82082TG,272 kg to 341 kg (600 lb to 700 lb) natural gas dryers or the uniform by-pass conveyor. The Milnor 82082TG pass-through gas heated dryer incorporates all of the energy-saving and efficient design features found in Milnor's smaller automated dryers used for PulseFlow™ batch washer systems. The 82082TG dryer has Milnor's unique Energy Saver Seal™ which keeps air flowing through the goods without escaping around the outside of the basket. The dryer has a fixed tilt that allows the heaviest goods, which are the wettest, nearest the heat entry. It also incorporates a modulating gas valve to maintain inlet or outlet temperature within one percent of set points. This allows for optimal dry times without compromising energy efficiency, as opposed to a high-fire/low-fire scheme, which reduces burner efficiency. 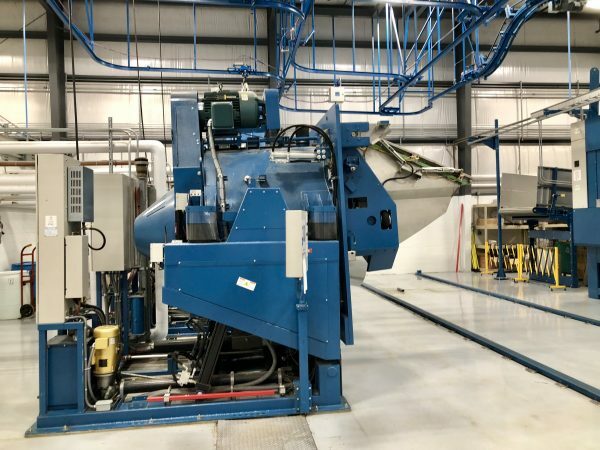 Once the dry cycle is complete and programmed cool down is achieved, the fixed tilt of the dryer allows for fast unloading without the need for mechanized tilting or operator attention since the basket is always tilted toward the unload end. 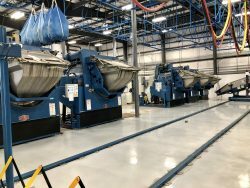 The wash aisle at Clemens Uniform is designed to receive one (1) each additional Milnor 72046M5K and one (1) each 82082TG dryer to allow for future growth. 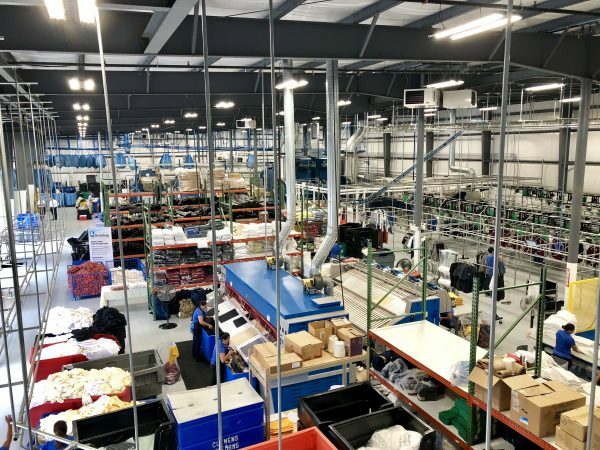 The Speed Check overhead soiled rail system works seamlessly with the Milnor washer-extractor loading allowing Clemens Uniform to significantly reduce full time employees, resulting in increased labor savings and reduced lost production time. Clemens Uniform is positioned for long-term growth opportunities while continuing to provide the highest level of customer service.